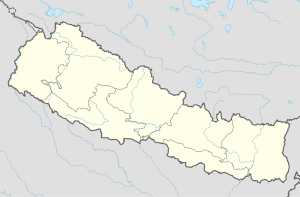 Saijuwal Takura is market center in Sharada Municipality in Salyan District in the Rapti Zone of western-central Nepal. The place formerly existing as Village Development Committee was annexed to form a new municipality since 18 May 2014. At the time of the 1991 Nepal census it had a population of 3,137 living in 593 individual households. Saijuwal Takura has an FM community radio station, Radio Rapti - 104.8 MHz. ^ "Nepal Census 2001". Nepal's Village Development Committees. Digital Himalaya. Retrieved 13 November 2008. This Rapti Zone location article is a stub. You can help Wikipedia by expanding it. This page was last edited on 15 June 2017, at 19:15 (UTC).